Unless you own a subscription to NBA League Pass and regularly insist on boring your co-workers to death with in-depth explanations of the triangle offense, there’s a good chance you’ve never heard of Royce White. Drafted by the Houston Rockets with the 16th pick in this year’s NBA Draft, White was seen by scouts as the prototypical boom or bust player. In his one season at Iowa State, White was named as a First team All-Big 12 selection and became the only college player in the country to lead his team in all five major statistical categories1. Blessed by the gods with hands the size of frying pans and a quickness that belied his 6′ 8”, 260 lbs frame, White was built to fulfill the duties of the modern NBA power forward. That was the boom. The bust was that White was known as a bit of a hard case after a series of off-the-field issues during his brief tenure at the University of Minnesota in 2009. After transferring to Iowa State in 2010, head coach Fred Hoiberg was able to tap into the young man’s potential by surrounding him with understanding and compassionate assistant coaches who could accommodate his unique needs. There were questions before the draft as to whether White could handle the rigorous demands of an NBA schedule and, thus far, the answer has been an affirmative no. 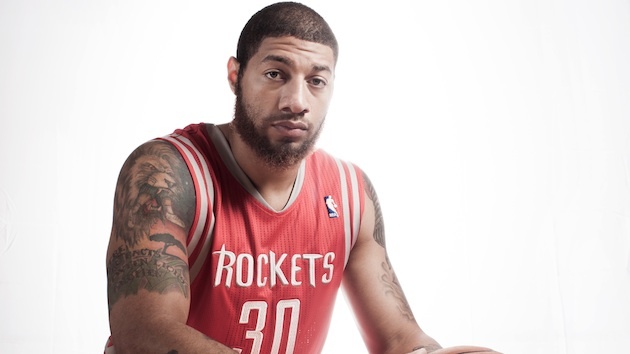 Yesterday, only 8 games into the 2012-13 season, the Rockets sent Royce White down to their Developmental League team in Rio Grande. After missing the opening of Rockets’ training camp due to a contract dispute, White traveled with the team to their first few games before resuming his absence from team activities earlier this week. He has yet to play a single minute for the Rockets this year. Normally, this would be another unremarkable story about a troubled young man throwing away a multi-million dollar career by engaging in reckless and regrettable behavior. However, White’s case is special because it doesn’t involve the typical litany of DUIs, drug possession charges and domestic assault arrests that usually characterize unruly professional athletes. Royce White is missing in action from the NBA because he suffers from Generalized Anxiety Disorder and Panic Attacks that leave him unable to compete with his teammates and unable to function. White can trace the origins of his anxiety disorder back to elementary school when his best friend collapsed and almost died during a basketball practice due to an undiagnosed cardiac abnormality. His friend survived and had emergency corrective surgery, but White was never the same and to this day gets anxious whenever he can feel his heart rate go up during conditioning drills. White still wakes up 3 to 4 times a night in a cold sweat and has to occasionally call his mother in the middle of the night to calm his nerves. While he was fortunate to find a caring supportive network of coaches and peers at Iowa State, White has found nothing but frustration and misunderstanding in his brief NBA career. Due to his anxiety issues, the 21-year old has an intense fear of flying and will do almost anything to avoid getting in an airplane, While at Iowa State, his coaches did everything they could to make sure that White was able to travel by bus or car to away games when it was feasible. With the NBA’s 82-game schedule and long-distance road trips, navigating a season without logging some frequent flyer miles is incredibly difficult. Late night plane trips are a reality of life in the association and a large chunk of White’s contract negotiations revolved around how often he had to fly over the course of the season. Unlike any athlete I can recall, White has been outspoken about his struggles with Generalized Anxiety Disorder. Ironically enough, the young man who regularly suffers debilitating panic attacks has not shied away from the scrutiny that comes with being open and honest about personal mental illness. More so than most public arenas, sport is a place where perceived weaknesses are not tolerated and the expression of fear and doubt are forbidden. To admit that you have anxiety or that you are depressed is to broadcast to your teammates and opponents that you are a liability. It is not a culture that allows for admissions of vulnerability and outpourings of emotion. Much has been made over the influence of brain trauma on the high rates of professional athletes who commit suicide, but a good deal of it also has to do with being surrounded by a culture that expects you to be paragons of toughness and grit. After all-pro NFL linebacker Junior Seau killed himself earlier this year, his former teammates remarked that they never heard so much as a word from him about his struggles with depression. In an emotional interview after his death, ESPN analyst Marcellus Wiley, who used to play with Seau, talked about how he spoke with Junior after a car crash he had been in a couple years earlier. The crash was being reported as an attempted suicide, but Seau reassured Wiley that it was just an accident and that he fell asleep at the wheel. The next time around Seau used a shotgun and everyone knew with sickening clarity that it was not an accident. Earlier today, Royce White announced that he is prepared to walk away from the NBA if it means maintaining his health. I certainly hope that he is able to work out something with the Rockets brass and that he finds a way to manage his anxiety like he was able to at Iowa State. It would be a waste of a promising career to see White succumb to his illness and, no matter what he says publicly, he will always second-guess himself and wonder what could have been if he chooses early retirement. The man already claimed to be retiring from college basketball after his struggles in Minnesota and we know how long that lasted. Regardless of the outcome of his playing career, White has certainly done his part to demonstrate the seriousness of Generalized Anxiety Disorder while showing that it is possible for a hyper-masculine all-pro athlete to be candid about his or her mental health struggles. 1The 5 categories are points, assists, rebounds, steals and blocks.